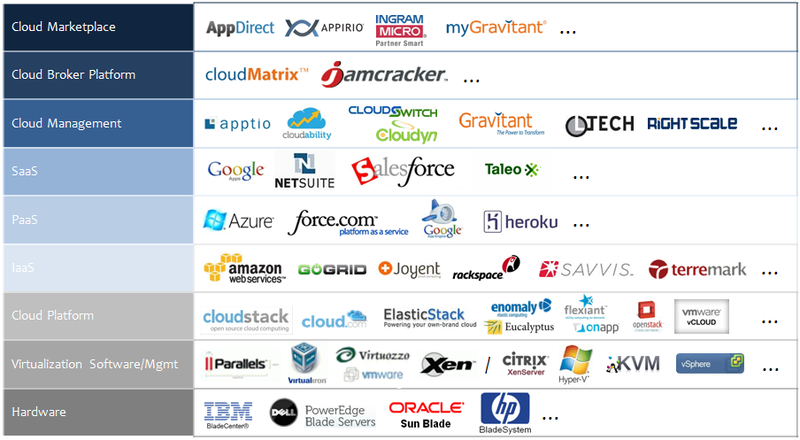 There are now thousands of firms offering “cloud” services. They range from large suppliers, such as Amazon, Google and SalesForce, to specialized enterprises such as Terremark and Savvis. The potential scope of these firms is global since they can potentially deliver their products anywhere. These firms can be either cloud brokers, cloud managers, cloud operators (SaaS, PaaS or IaaS), cloud platform vendors, software providers (VMware, Citrix, Microsoft) or cloud hardware suppliers (IBM, Dell, HP). The benefits of switching a firm’s highly customized data center operations into any combination of Private, Public or Hybrid clouds will decrease operating costs as well as deliver greater security, more effective utilization of capacity and improved availability. The evidence that cloud computing delivers such gains is undisputed. However, to realize the benefits of cloud computing will require making major changes in the ways computing is managed. How to migrate into a cloud-based computing environment is a decision that every chief information officer is facing at this time. One can progress incrementally by starting with the progressive virtualization of in-house servers. Such gains can be made quickly as the number of computing platforms is reduced. In another case, a firm can transfer its computing workload to a services provider, such as by outsourcing of its e-mail or accounting. Costs will be reduced and the quality of this service will improve. The problem with all such moves is that a firms’ IT operations will commit to an incremental improvement, without engaging on a path that would lead to much greater information effectiveness for the entire enterprise. 1. Every one of the thousands of vendors will attempt to “lock in” its customers into progression that favors its proprietary offerings but only for the contracted work. 2. A proprietary contract will limit access to public cloud services. It is unlikely that such arrangements will be interoperable with proprietary private cloud services. 3. Data centers from different parts of an organization are likely to pursue incompatible cloud applications. 4. Security policies, back-up and fail-over capacity will be either inconsistent or not achievable. 5. The sharing of capacity and managerial control cannot be implemented. Large supervisory staffs will remain in place. A customer should be able to select from the above list those suppliers that comply with open standards, such the Open Virtualization Format (OVF). Specification describes an open, secure, portable, extensible format for the packaging and distribution of software to be run on virtual machines. OVF has arisen from the collaboration of key vendors in the industry and is accepted in forums as a future standard for portable virtual machines. The Open Cloud Computing Interface (OCCI) comprises a set of open community-lead specifications. OCCI is a protocol and API for a range of cloud management tasks. OCCI was initiated to create a remote management API for IaaS services, allowing for the development of interoperable tools for common tasks including deployment of autonomic scaling and monitoring. It has evolved into a flexible API with a focus on integration, portability and interoperability while offering extensibility. The current release of the Open Cloud Computing Interface is suitable to serve many other cloud models. The advancements in cloud computing have lead to a proliferation of vendor offerings as vendors are getting reorganized to support cloud computing that is interoperable and integrated. The most advanced feature of this turmoil is in the adoption of software-defined networks, as the functions of network switching and routing are getting relocated from hardware devices to software-managed servers. A similar evolution is now taking place in the shift from security hardware “appliances” (stand-alone fire-walls and malware-tracking) into software-defined capabilities. In this race towards the increased integration of cloud software with layers of server computing, rather than adding hardware devices, the leading firm is VMware. They have announced the open source “Cloud Foundry” as a new product. Budget pressures as well as increases in the demands for computing services have placed demands on chief information officers to accelerate the conversions to cloud computing. Thousands of new firms now offering cloud solutions need to be examined for a demonstration that their offerings will have a well-defined migration path for delivering long-term gains. As one of the selected acquisition criteria the demonstration of an evolutionary path will also have to include compliance with published standards as well as the absence of proprietary solutions.